What's Your 2019 Digital Marketing Strategy? What can you change? I’m writing this article on the final days before Christmas/New Year, and it’s a perfect time for reflection. How has your year been? What thoughts have you put to your 2019 Digital Marketing Strategy? Before I begin, I would advise printing this out, grabbing a pen and a notepad. This article is around 6000 words, and there are a series of steps you will need to take to be ahead of your competition. Not all of it will apply to you, so feel free to skip ahead to the relevant parts. If on the other hand, you’ve read it all, annotated and still have more questions, please feel free to contact me, and we can have a good chat. My contact details are at the bottom. This quote is very apt for the time. In 2019 we’re going to see some of the most significant changes in digital marketing than we have in previous years. And that’s an understatement. Activities you might have been employing in the past are no longer going to be as effective as they used to. I’m certainly not saying they won’t work, but they won’t produce the results they once did. So what can you implement today that will serve you well with your digital marketing in 2019? Google crawl through their index and take into account 200+ factors to determine where your website comes in the results list for the user’s search. That’s a hell of a lot of work for a small or medium sized business in just your website management alone. So what do you do? Well, guru’s such as Neil Patel hit the nail on the head. By focusing on the path of least effort, you will get the maximum return. For example, video is a factor but considered a very small nuance. Customer journey and user experience (UX) has never been so important. If your website isn’t super easy to navigate, you’re going to deter your potential customers. This may appear on your analytics as an increased bounce rate of unique visitors. Time taken to load the website. There are a multitude of reasons to why your site might not be operating at the speed it should. Again, you can use free tool gtmetrix.com to find out. The two major challenges are: the hosting platform and images. Big images to be specific. Yep. Fast right. Do I need to build a new website if my site is really slow? No, not necessarily, this is apart of your continuing website management. Two tools you’ll need to help you for these specific challenges: Siteground and TinyPNG. Structure of the content. You need to ask yourself, can you readers get to all the relevant information easily and in an engaging manner. This is very similar to UX and you need to think about burying content in order to make your website more engaging. Let’s talk about Google for Business. There’s not a huge amount to say currently, but there is an ever growing potential to be consistently using it in 2019. This is all assuming all your business details are correct. To login your Google for Business? Click this link and follow the instructions. Google have laid it all out for you. If you would like to see the results you could get, Neil Patel has it detailed down for you. I’ve started off this section off with the analytics because they are fundamentally, the most important part. It’s like this, if you walk on a straight line, blind folded, you’ll probably get there but not as fast as if could see. Google Analytics is having the ability to see what’s happening with your website and understand the constant changes you’re making which will eventually lead to more sales from your website. Think of it as your central hub. What is Google Search Console and why do I need it? Good question. 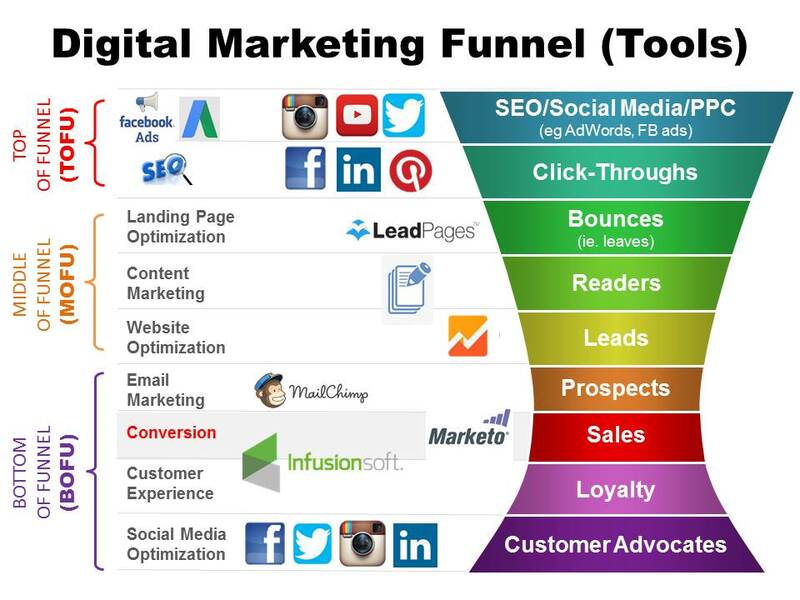 Think of it as a road map – a digital marketing roadmap. It will provide you with what is past, present and where you need to go in the future. Simples really. If you haven’t got it already for your business or don’t understand how to use it, then I would recommend contacting an expert or having an explore yourself. For example, we’ve gone for “swimming lessons” because at one point in my life I was a swimmer and swimming coach. So if we had an imaginary company that sold a swimming float, we’re already starting to paint a picture of one type of customer. Note: Google Trends shows you the relative popularity of a search query, whereas Google Keyword Planner shows absolute search volume data. They both represent a very similar picture but not the same. Although still free, to access Google Keyword Planner you need to have a Google Adwords account. Wow, so it’s already very clear that the parents looking to have swimming lessons aren’t that interested in buying a swimming float at the same time. If the graph correlated with each other, we would have concluded the opposite. So when we’re thinking about what to write, talking directly about the “swimming float” isn’t going to get me very far. This could change later with more data. It’s free. It’s easy to use. Helps create ideas. Answer the Public scraps Google and Bing to produce results on what users have been typing into the search engines on that specific keyword. 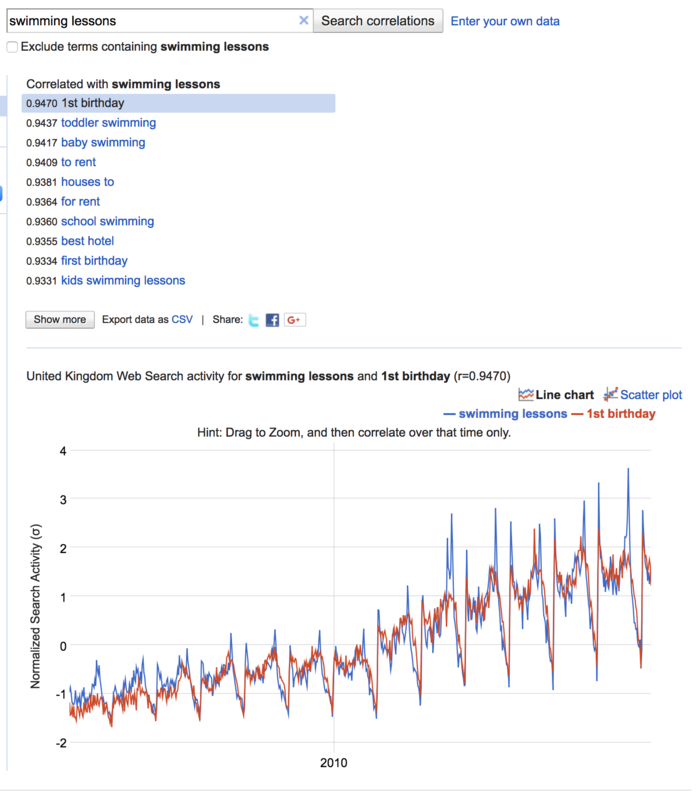 Once you type “swimming lessons” into Answer the Public, here are the results. Not all the questions are going to be relevant, but already, I’ve found some content titles I want to use in my imaginary swimming float companies content. 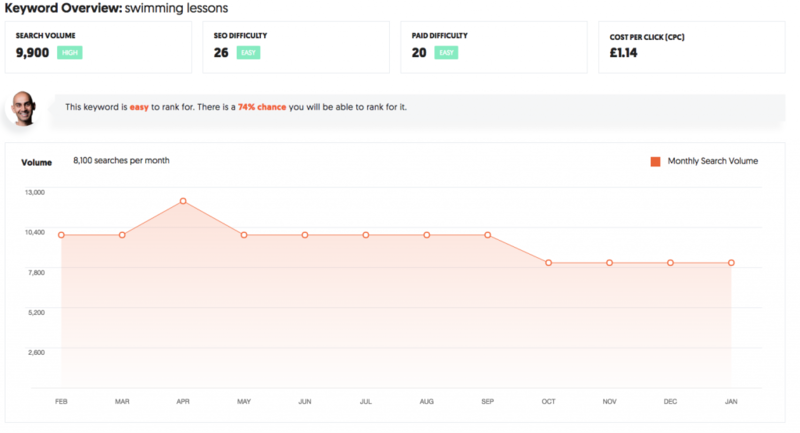 Are swimming lessons worth it? When do they start swimming lessons for babies? Can anyone teach swimming lessons? But before we get carried away with this one keyword, let’s just do some more digging. 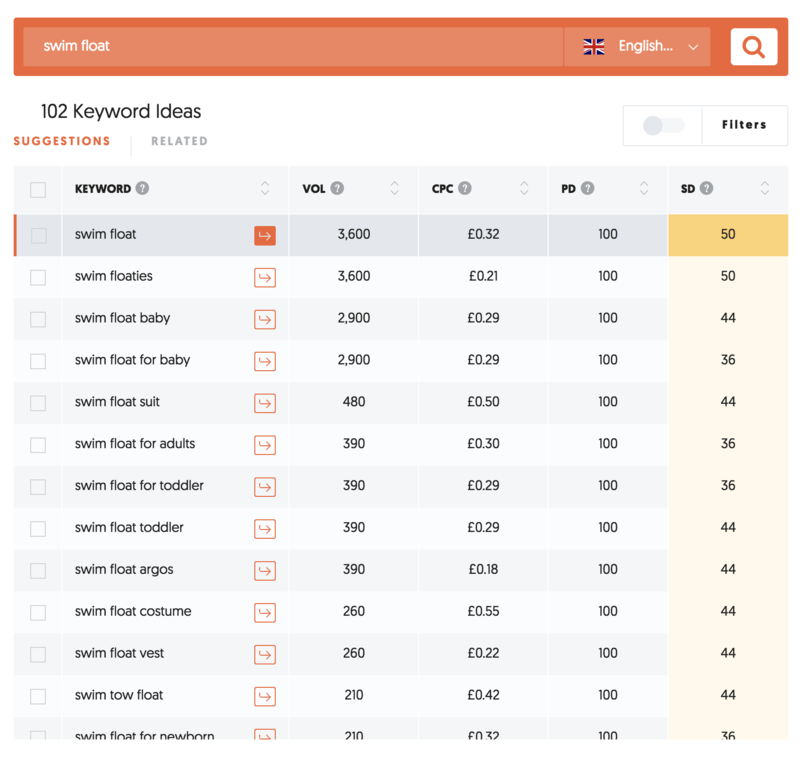 Ubersuggests is another great Keyword Planner because let’s say further down the line; you’re going to do some PPC (pay per click) aka internet advertising in short. 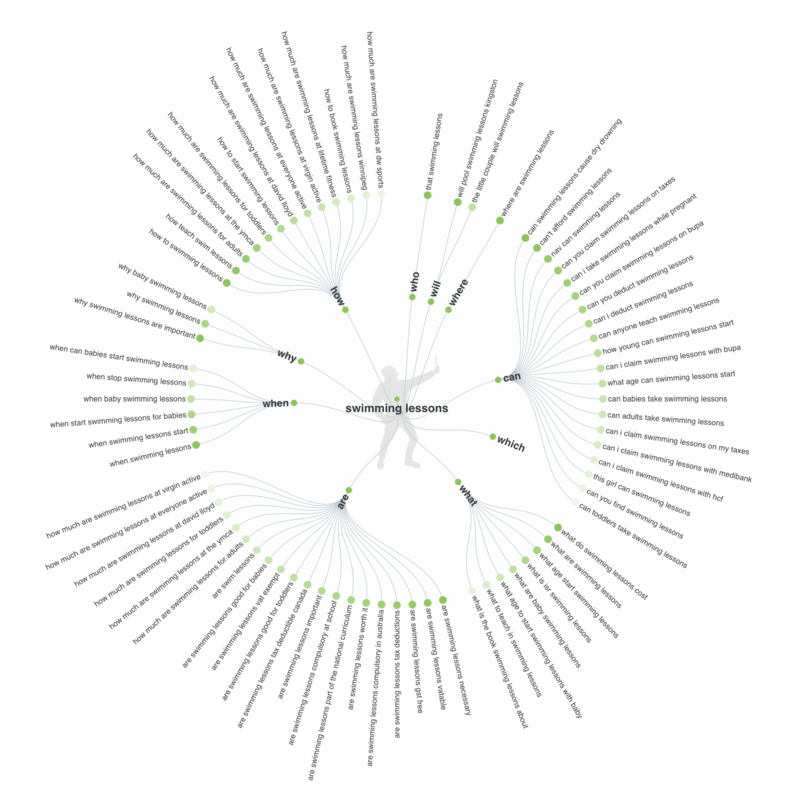 You can find out how cost effective that keyword is. Note: you can narrow down your PPC using Google Trends under “Interest by City”. So far so good. Safe to say, if you own a swimming float company, you ideal want to be found when people are looking for swimming lessons. If you’ve slightly lost you at this point why, here’s the analogy. When buying a good bottle of wine, you may see some advertisement next to the wine for some fantastic cheese. How likely are you going to buy that cheese? If you’re anything like me, then the probability is pretty high. Before I move onto more ideas we can implement into our content marketing, I want to quickly go over some of the benefits of Google Trends. I changed the search filters to over a 5 year period and the results were pretty clear. Every January and September parents are booking in their swimming lessons for the next block. See the two peaks closely following each other in the graph. For any parent with young children, this may be obvious, but if you’ve not been in the game for a while, you’ve most likely forgotten. Automatically, we need to start preparing for these peaks in October and June to allow time for SEO. It works out roughly to be 3 months. Note. In our data above the spikes are pretty consistent across the board. If there were an unusual outliner, my recommendation would look to avoid these “keyword unicorns”. All the above has been an analysis on a web search. That’s great but this is 2019, and there are more channels than just Google Search. You can also repeat the process with image search, news search, Google shopping and YouTube search depending on what your objective is and where your customers consume media. And of course, guest blogging. It has been and still is a fantastic way to increase your domain authority on your website. What your DA is, is basically means, how authoritative does Google see you in its search engines for your expert subject. Who are the best people to be guest blogging on your site and what strategies can you employ to gain more guest bloggers on your site? My recommendation would be to first look into your “black book” so to speak and then head to Twitter and LinkedIn. On Twitter, there are a number of local business hashtags across the country which you can jump into. LinkedIn, you have two options, create a shout out post or make it a focus to your LinkedIn outbound campaign. Ok, let’s take the imaginary swimming float company as an example. The people that first come to mind are independent swimming instructors and private teachers. They would be your early adopters as they would be incentivised to promote their brand on your site. Funnily enough, these guys can be actively found in Facebook groups. Note: ever spam these groups. This is a sure fire way to get kicked out and never let back in. Wider guest bloggers could be complementary products. For example, if you have a cool, funky baby towel and colourful armbands, then collaborating together and engaging with each other is going to help you gain more traction. …the crutch to how you’re going to dominate content marketing/SEO in 2019. Now, in reading this article, I hope you don’t think we’re the experts and know everything. That’s certainly not true. We know a lot about marketing as we’ve been in the game for a long time and have had the experience of trying and testing different strategies. Not everything will be written in this article, so I do encourage further reading. Fortunately, with the proliferation of information, there are hundreds of specialists in the marketing field. We’re a big fan of Neil Patel, Moz and Yoast. They have a lot of guidance on offer and help you get to where you need to be in your marketing. Ok, enough waffle. 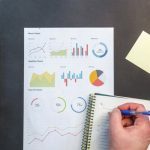 Here’s what we’ve collated together on what you need to employ using Google Correlate in 2019. From the above information, we’ve established how to find your keywords that you’re customers are using but what if you have high traffic, expensive keyword? For a smaller company, it’s going to be a very long time before you’re able to drive any real business through it. But do you ignore these lucrative keywords? Necessity is the mother of invention. You need to attract customer before they’re ready to buy. Hey, presto! “1st Birthday”….eh. What now? Didn’t expect that did you? Remember, some keywords will be relevant and will not. For instance: “to rent”, “houses to” and “best hotel” can be excluded. If you write blog content, going into depth into those phrases, you’ll appeal to a similar audience. “Best waterproof mascara” – I particularly like this one because it’s more outside the box and great opportunity for a guest blogger to come in on. The big difference between the first lot of phrases to the second lot is the timing in which the blog articles need to be written and SEO for it to have an impact. 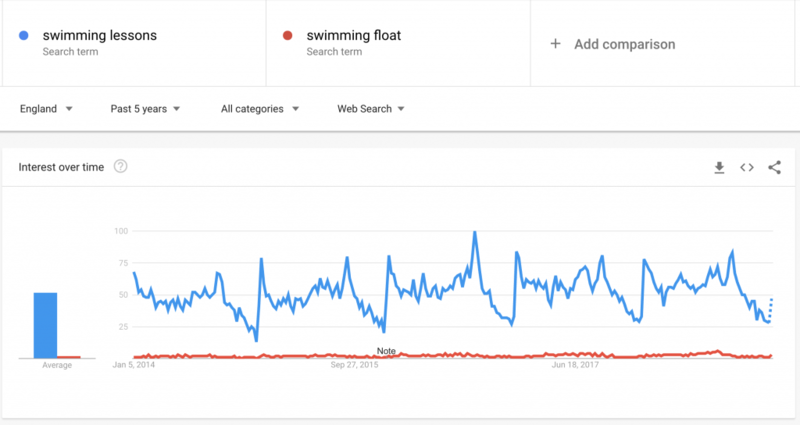 We established that “swimming lessons” required to be written depth in October and June so that they are established in Google’s search results by January and September when they are actively being searched for. 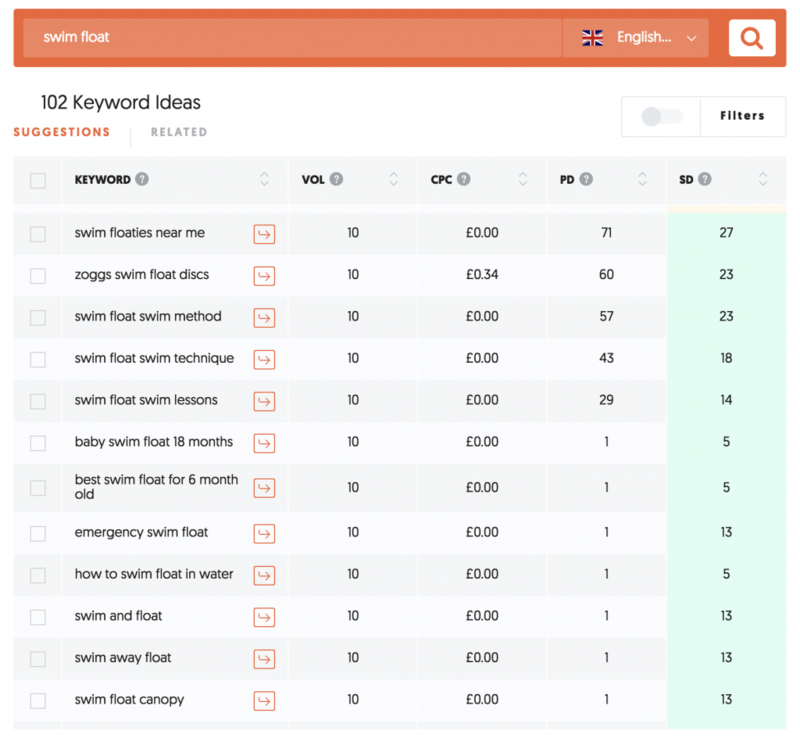 Using Google’s Correlate for the supplemental keywords such as swimming floats shows that your content needs to be established in Google’s search results by April and May. See below the consistent spikes in August. Be careful when using Google Correlate to choose the right keyword phrase to compare it against. The graph below shows swim float against best caravan and shows a high correlation. 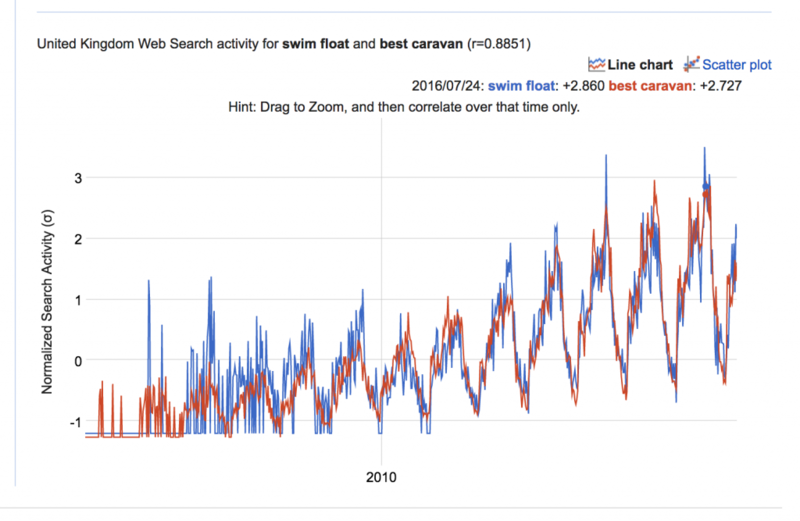 Presumably, there is a correlation because swimming floats and caravans are both associated with going on holiday. The with SEO 2019 is that it’s hard to rank for keywords. Take “swim float” for example, it is exactly what the product is for our imaginary swimming float company and when I double checked on Ubersuggest, the data suggested it would be incredibly hard to rank for it and predicted to spend A LOT of money on Google’s Pay Per Click keyword advertising (PPC) (see below). The easier to rank “long tail keyword phrases” means you can write in-depth blog content and so get higher up in the search engine results relatively easily. The fact that you are targeting longer phrases means that when somebody does visit your site, they are more likely to convert to whatever action you want them to take. Add these phrases to the page that already ranks for the head term and adjust the content. Ensure the content is still readable. According to Neil Patel, because you’re already ranking for the head term, he predicts that you will shoot to page one within 30 to 60 days for the long-tail variation by adjusting your content. Simple right? The trick is in understanding your customers so that you pick the right buyer intent keywords to cause a sales or a lead. How to create engaging headlines with my buyer intent keywords to increase my conversion rate? Think clickbait headlines on Buzzfeed articles. Engaging headlines are designed to engage the audience. I’ll go into more depth later in the article to why is this important. Clickbait are engaging headlines that you click on but the article itself has nothing to do with the headline. Do not do this. Ever. I did “x” and this is what I learnt…. For example, “How to use a baby swim float for 18 months”. The imaginary swimming float company many only have one float but it could be used a thousand different ways by the consumer depending on their ability. Questions is, why do they need to be engaging? Let’s start with the obvious one, more engaging headline = higher click-through rate to your website = more traffic in your sales funnel. Boom. Here’s the other reason, I’ve talked a lot about content, and yet I spend a lot of my time on social media. Why think of it this way? Think of your favourite brand – how long do you spend on their website every day? Ok, now think of how much you spend on their social media every day? Yes, a big media channel such as UniLad has a website, articles and social media posts. How many times a day do you spend sharing their content from a similar brand? If you want an exact number and own an iPhone, head to your settings to discover a detailed breakdown of your screen time. Exactly. So we need to use social media to distribute your brand’s content to your growing audience. In our recent social media presentation, we emphasised the importance of engaging headlines and in keeping with linear thinking, engaging social media posts. Buffer go into a very detailed article on all content if you’re looking for further reading. Each of the different lengths have a purpose. Think of it this way. Whilst the ideal is 1500, how many busy owners can read or write articles are that length all the time as well as consistently produce them to be pushed out onto social. Hence why you might have for the shorter articles. Note, 350 is a very specific number as it’s the shortest about of words Google consider for an article to be relevant to the reader. So, after saying many business owners won’t read super long articles (2000+), why have I written an over 5000 word article on marketing. Well, more further reading on cornerstone content can be found here by Yoast. There are pro’s and con’s to each of the different lengths, so it’s always best to be doing them all. Finally, how on earth do I optimise my website so that potential visitors can find my website when they search Google for the keywords I have discovered? That was easy! I joke, Yoast is a plugin on your website. All you need to do is follow the instructions. Again, I recommend contacting an expert or exploring more yourself. It really doesn’t take long. I’ve combined social media and email marketing because like anything in marketing, it’s all interconnected. From covering the content and distribution onto social media, we can already see how social is going to be even more important for SMEs in 2019. It’s still one of the biggest areas which, as consumers, spend time on the internet. But what if there are more opportunities for us? Delivra reported that 51% of B2B marketers say a lack of an effective strategy is their most significant barrier to email list success but what if you could build your own email list with “warmed up” contacts? The chitter chatter on social are all claiming that LinkedIn is where it is at. If you’re like us, and you’ve been using it since 2004, it’s a no-brainer. Hubspot have reported that LinkedIn is 277% more effective at generating more leads than other social media platforms. You can connect to a number of people, initiate a conversation, just as you would at a networking event and follow them up via email. How many people do I need to connect with on LinkedIn for it to be effective? Why can’t I just buy an email list and fire it out? What’s the advantage of building my own email list? The first question is easy. Generating leads and prospects is still a numbers game at the end of the day. Yes, we want as many people in the list to convert but in reality that never happens. Let’s be honest. So ideally, we need as many people as possible. Realistically, if you send out 300 messages, you’re likely to get 30 message back and of them, 3 will convert. The problem with buying in a list is that you can buy different grades, and even then you’re relying on trust to whether it’s good or not. With GDPR (yes, I don’t think I can get away with talking about email and not mentioning it), under legitimate interest you have to be very sure that it’s a business email you are contacting and not a person’s personal details. Email marketing systems are also getting stricter on what lists you can use. If you’ve bought a list in, fire an email shot and get a whole bunch of unsubscribes and reports back, they will kick you out if you’re unable to provide an ethical process of obtaining the data. So, 300 messages or even 3000 messages is a lot. I mean what business owner or marketing manager has the time to send out that many quality messages over a short period of time (let’s say a fortnight). or a small cost, you can connect with hundreds of your target market. With the advent of digital marketing over the last ten years, the way the sales funnel has managed to radically changed. In the days before the Internet, the salespeople pretty much controlled the journey as they had all the information. This has now changed as the buyer now has all the information, and the salesperson is only involved at the later stages. This means your marketing has to work a lot harder and be better integrated if you are to move a prospect down through the funnel. The Internet has also brought in another conundrum; the Paradox of Choice. The explosion in choice has meant that it is now harder to find what you want because there are so many choices out there. Our brains were never developed to handle so much choice. Therefore, you need to make your customer journey as seamless as possible in order to reduce the loss of attention due to all the choices available to somebody. The statistic go along the lines of: “Marketing do much more of the sales funnel than previous years and can go as far down as the decision making process of the funnel before the salesperson gets involved. However, the later part now takes 25% longer because of the Paradox of Choice”. For example, let’s say you’re redecorating and you’re given the choice between 7 colours to paint with (red, orange, yellow, green, blue, indigo, violet), which one would you choose? Changing the scenario, if you’re given two colours (blue or violet), which one would you choose and in which scenario was quicker for you to make a decision? What I’m about to say next isn’t groundbreaking but a trap many SMEs fall into and why it’s worth mentioning. I can see that we have a number of mutual connections and thought it would be good to connect. Over the many LinkedIn training workshops KUB have delivered, I ask everyone what they do when they receive this message and the response is always the same every time. Wow. That’s going to significantly reduce our response rate considerably. And there’s a good reason why. When you connect with a person on LinkedIn, meet someone at networking or see a post on social media for the first time, that person is still operating in the awareness stage of the sales funnel. By asking them to buy into your services with the first message is like skipping the sales funnel process and heading straight to the decision stage. Of course, the potential customer is going to say no. You’ve basically walked into a room and shouting: “BUY MY SERVICES”. Everyone will think you’re a lunatic. I certainly do. Instead, we need to put some effort in and employ conversational marketing tactics. Drift break it down well, if you wish to read around the subject. Again, everything I’m saying is nothing new. For years, telesales companies have spent thousands of pounds on resources to get effective sales scripts. Who do you need to connect with? Who is your target market? Why would they want connect with you? You’ll find this will become your 3 part process to engaging leads on LinkedIn through social selling. For further reading, head to Amazon for Jamie Shank’s “Social Selling Mastery”. I’m looking to reach out to local professionals within the [industry] sector. I found your profile from looking at [company name] and wanted to get in touch. I hope that’s ok with you? How’s business? Who are you interested in connecting more with? Notice I’m constantly asking questions. Think – what do you do when you meet someone for the first time at a networking event – “What’s your name? “What do you do?”. You ask questions. Unfortunately LinkedIn gives you the privilege of a person’s profile therefore changes our natural behaviour when we interact on both the outwardly and inwardly messaging person. The only thing left is for you to give it a go. With outbound LinkedIn messages and consistent social media posts and articles, you complete the circle of your prospects being educated about your brand. Remember, consciously act as if you’re at a networking event and avoid direct sales language and you won’t go far wrong. Ok, that’s LinkedIn, but there are other platforms out there changing. I will never be able to go through absolutely everything in one article because, by the time I’ve written it, everything will have changed again! Organic social media is dead. If you’re looking to generate business from social media, you need to pay for advertising. However, saying that, if you’re look at social holistically, you still need to be consistently posting. The ideal is 3-7 times a week depending if you’re B2B or B2C with a educational/entertaining focus. The trap is to have sales message after sales message on your social. Consumers are more reluctant to hard, direct sales and you won’t get the engagement you’re seeking. Video: “Views of branded video content have increased 99% on YouTube and 258% on Facebook between 2016 and 2017.” And it’s only growing. Finding affordable video content for SME’s is hard. We know. We’ve been on the hunt. But thankfully, there are businesses out there looking to help you produce a video for your business. At the end of the day, whatever you produce, as long as it’s authentic and consistent, you really can’t go wrong. Note, user’s attention span is getting shorter. Ideally look to 30-60 seconds. Finally, messenger marketing. What is it and why do I need to know about it? Well, we go back to the topic of conversational marketing and social selling. Think about it, how much time do you spend on Social Media compare to Facebook Messenger and WhatsApp, to name a couple, messaging your friends and family? 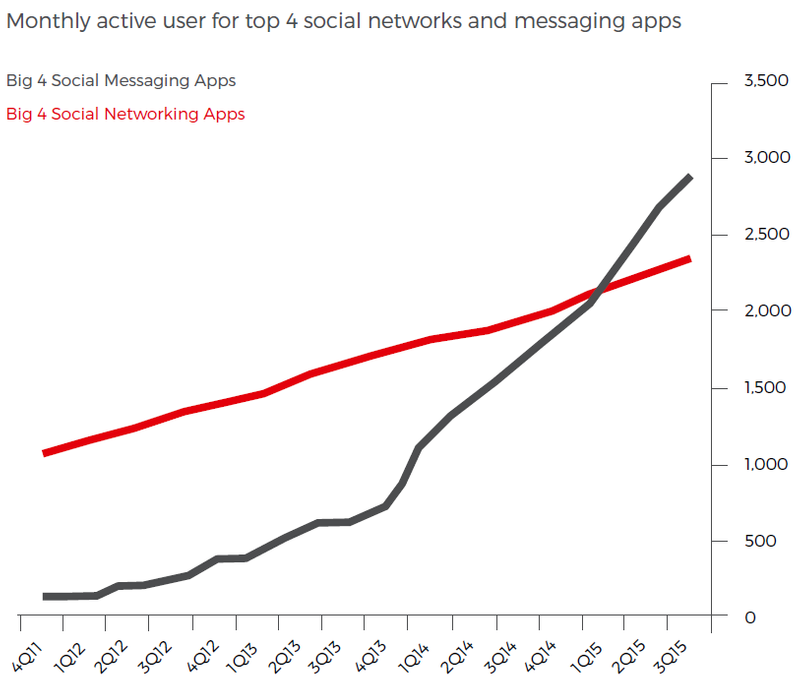 With the rise of Messenger Marketing, it can be frustrating as Messenger is self contained. Unlike the public tweets you put out on to Twitter, Messenger is private and therefore hard to track. Marketers call this Dark Social. Hootsuite have provided an interesting article to cover this. But there is something you can do. ManyChats. They provide hundreds of hours of tutorials on how to employ Messenger Marketing through chat automation. A great place to start is this blog. Last but not least, let’s strip email marketing back to basics. What is it supposed to do? Why do you want to email a list of prospective clients? As an SME, you’ll always be looking to improve the metrics – open rates and click-through rates are our main indicator of where a prospect in the sales funnel. As you’re looking to maximise your resource, you’ll constantly be tweaking the subject line, calls to action, images, headers, layout, link positioning, copy, length, tone etc etc etc…..it goes on. But what if 2019 the consumer has become desensitised from over designed emails? Here are some statistics you need to think about. A survey by Hubspot in 2014 asked thousands of professionals whether they prefer HTML or text-based emails. “Nearly 2/3 of the respondents said they preferred HTML and image-based emails”. However, in reality, HTML reduce open rate AND click through rate. Geees. Marketo reported that 94% of people check their reason to go online is to check their emails. Plain or Pretty – what’s the way forward? Having performed numerous tests and observed a number of marketing guru’s, this is how you can increase your email marketing effectiveness. Keep your email marketing strategy, personalised, authentic, relevant and concise. Monitor your analytics and adapt. We highly recommend Active Campaign for SMEs because it’s affordable and has a huge amount of automation capabilities. Automation is the future for email marketing. Well, 2019 is certainly going to be interesting. There’s a lot a company needs to do in order to get ahead of their competition and rising. If you follow as much of the above as possible and more, you’ll find your marketing will grow exponentially. If you would like help with developing your 2019 digital marketing strategy or your recruitment using digital marketing, KUB is a hybrid digital agency which means we will train, manage or deliver your marketing for you. For more information on how we can help you, go to How to Drive Sales with Digital Marketing.We have helped over 400 companies across the North West of England for the last 17 years. Note to cold callers using my number from this article: I have zero purchasing power but I can promise good chat.